Is Obama Planning a Third Term as President & Is Congress Able to Stop Him? A third term for President Obama? Impossible you say. Unconstitutional you say. True. The 22nd Amendment says, "No person shall be elected to the office of President more than twice." In 1947 FDR had just been elected to an unprecedented fourth term. After twelve years in office, political cronyism was so deeply ingrained in public law and philosophy that Congress called a Constitutional Convention for the purpose of proposing the 22nd Amendment; subsequently ratified by three-fourths of the states and enacted into law. So how can President Obama seek a third term? Well, the Constitution also says in Article II, Section 1 that, "No person except a natural born Citizen. . . shall be eligible to the Office of President." How's that one been working out for ya? We will no doubt be hearing much more about that should Senator Ted Cruz (R-TX) seek the presidential nomination, but that's another story for another day. Two weeks ago the Washington Post ran an article by Jonathan Zimmerman, a professor of history and education at New York University, entitled "End Presidential Term Limits." It was by no means the first time the issue has been raised. 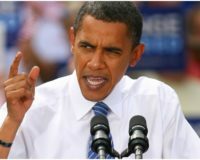 Last January the Western Center for Journalism published an article asking, "Is Obama Planning a Third Term?" The author observed that even after his re-election, President Obama was still attempted to solidify his 47% dependency base -- as has now been further evidenced by his support of current populist issues such as the striking McDonald's workers, his calling for a increase in the minimum wage, extension of the unemployment entitlements due to expire at the end of this month, plus amnesty for illegal aliens. You can add to this his continued political campaigning while serious problems such as the destruction of the private health care insurance industry, nuclear proliferation by Iran and North Korea, pending debt limit debate, record unemployment, etc., go unattended. So what about the 22nd Amendment? How could he do that? No problem. The first week of December the House Judicial Committee held a hearing on Presidential Constitutional Violations, and what might Congress be able to do about it. Judiciary Committee Chairman Bob Goodlatte, (R-VA) set the stage by stating, "President Obama has blatantly disregarded the Constitution's mandate to faithfully execute the laws. He has changed key provisions in Obamacare without congressional approval, failed to enforce our immigration and drug laws, and ignored his constitutional duties for the sake of politics." The Committee invited four constitutional scholars to make recommendations as to how such Presidential actions could be curbed. The panel included Jonathan Turley, Professor, George Washington University Law School; Nicholas Rosenkranz, Professor, Georgetown University Law Center; Simon Lazarus, Senior Counsel, Constitutional Accountability Center; and Michael Cannon, Director of Health Policy Studies, Cato Institute. Within 20 minutes of calling the meeting to order, all Democrat members left the chamber, which might be construed as being indicative of their lack of interest in the subject at hand. Congressman Trey Gowdy (R-SC) raised the point that if President Obama can violate other laws of his choosing, can he also violate election laws? And if so, is there anything Congress can do about it? The answer from this esteemed panel of experts: Yes and No. Yes, as we have seen, this president can and does violate enacted legislation with impunity. Is there anything Congress can do about it? No. Is Congressional impeachment a possibility? No, not under the present control of the Senate. So, if Congress is helpless, what remedy remains? The panel concluded that the only remedy available rests in power of the ballot box. As I have pointed out in my previous four articles on government sanctioned voter irregularity, this has become a greatly weakened power. So is a third term for President Obama a distinct possibility? You betcha!